Coast Salish people have lived in balance within the Salish Sea ecosystem since time immemorial. Currently, over seven million people live in the areas around the Salish Sea, benefitting from the resources the ecosystem provides. By the year 2025, we can expect the population in the Salish Sea ecosystem to expand to over nine million people. Sustainability of the Salish Sea ecosystem is critical to our continued use and enjoyment of this place. 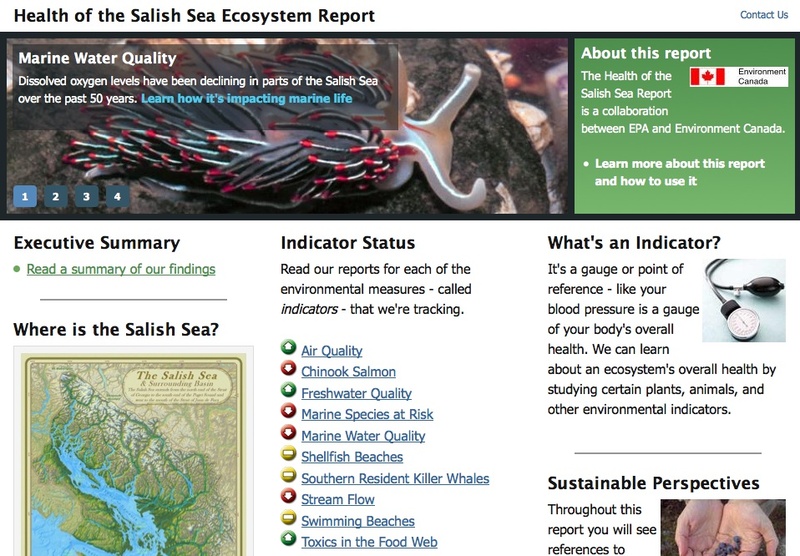 The Health of the Salish Sea Report - a joint initiative between EPA and Environment Canada - describes trends that help us identify priorities for future action across the entire Salish Sea. In 2000, EPA and Environment Canada signed a Joint Statement of Cooperation to facilitate cross-border understanding, dialogue, and collaboration on Salish Sea issues. From this partnership came the Salish Sea indicators to help show where we are seeing progress in sustainably managing the Salish Sea ecosystem and its valuable resources, where conditions are declining, and where course corrections are needed. For each indicator, we also present Coast Salish Traditional Ecological Knowledge as "sustainable perspectives." Coast Salish knowledge allows us to extend the timeline for indicators and draws attention to the significance of connections among indicators. View the complete report at the EPA website.